Welcome to Guess that Pokémon! 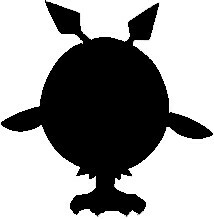 A game where I post a silhouette of one of the 649 known Pokémon (up to Black & White) and you guess which one it is! Spelling does count! For every correct guess, you get one point. If you name all the Pokémon in its evolutionary chain (past or future), you get an addition two points. An additional point for telling me which HMs in Generation 5 (Black & White) they can learn (and no cheating). For every incorrect guess in any category, its a reduction of one point. Player with most points at the end of the month is declared the winner and points reset! Good luck! Easy, Zoura and it evolves into Zoroark. And I have no clue what Hms. F**k i knew the second one by heart. Only if you want me to take over. I dont know every pokemon, just all of them up to Gen IV. I know ALL. Including glitch type. MissingNO FTW. OH i know that one. Hoothoot!